Are you looking for the leading cemetery headstone and monument company in Parma, OH? Classic Memorials can meet all your memorial needs and has been serving the Ohio area for years. Mark the passing of a loved one with a unique headstone or monument made with extreme care and quality. 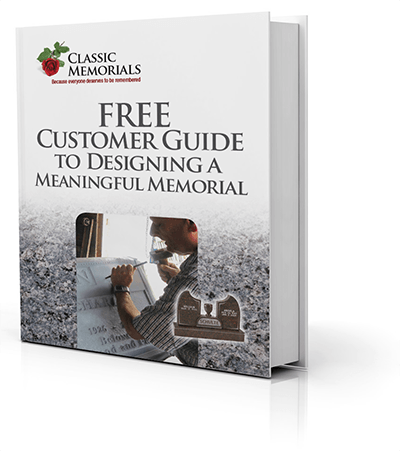 When looking for a memorial company, it’s vital to find one who utilizes a certified memorialist. To ensure your loved one’s memorial is only the best, a MBNA’s Certified Memorialist® designation guarantees excellence. Our president and memorialist, Val Konstantinovsky, is one of only two certified memorialists in the Ohio area and will not leave you or your family disappointed. We are the best memorial company in Parma, OH and our work shows it. Trust your dearly departed’s last memorial to a company with a track record of customers who are proud of the monument or headstone they have chosen for their loved ones. Our high-quality granite creates long-lasting monuments for future generations to pay their respects at. As the premier memorial company in the Ohio area, we have also created relationships with cemeteries and work with them to craft each memorial to their different standards. By working with us, you don’t have to worry about the hassle of ensuring your memorial fits regulations or plan its delivery. With a population of 81,601 residents, Parma is the seventh largest city in Ohio. Parma’s history dates back to the early 1800s and the town still showcases its history. We appreciate any opportunity to work with the residents of Parma to honor those who have passed away. Based on its rich history and settlement, Parma today has two distinct villages, the Ukrainian Village and the Polish Village. Each have homes and businesses that display and cherish their unique cultures and heritages. Events and festivals are held annually in each village as well. The recreation department of Parma also provides residents with ice skating opportunities, adult sports, and youth sports. With its unique personality, Parma is a delightful place for us to help families and friends remember their loved ones. Call us today for your monument or headstone needs. Your loved one’s memorial should be a beautiful reminder of their lives. Classic Memorials can deliver top-quality monuments and headstones that do just that. Contact us at 216-321-6740 or 800-278-8523 to start working on a cemetery memorial today.